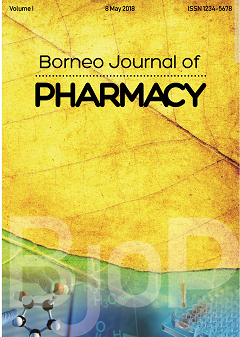 Every year, Borneo Journal of Pharmacy publishes between 18 and 20 articles divided into two issues. It was first published in 2018 using Open Journal System (OJS). Starting from Volume 2 Number 1 May 2019 edition, Borneo Journal of Pharmacy make changes to the template in the article that will be published. The amendment aims to make it easier for readers to observe essential parts of each page of the article. The latest article format can be downloaded in the Templates section. The publication of Borneo Journal of Pharmacy certainly participates in disseminating the results of research and review of science and technology development conducted by lecturers and researchers especially from UM Palangkaraya and other universities. This edition contains 8 articles consisting of Pharmacology-Toxicology, Pharmaceutical, Analytical Pharmacy-Medicinal Chemistry, Natural Product Development, and Clinical-Community Pharmacy. 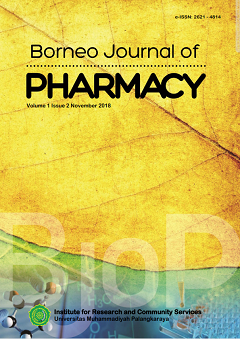 Borneo Journal of Pharmacy (Borneo J Pharm, ISSN: 2621-4814 (online)) is published by Institute for Research and Community Services Universitas Muhammadiyah Palangkaraya and licensed under a Creative Commons Attribution-ShareAlike 4.0 International License.